Step 1 In a small bowl, combine water, sugar and yeast. Set aside for 10 minutes to foam. Step 2 Make the dough. In a large mixing bowl, combine flour, salt, and olive oil. Work the mixture with your hands. Now, make a well in the middle and pour in the yeast and water mixture. Stir until soft dough forms. Step 3 Turn dough onto a lightly floured surface and knead for 10 minutes or until dough is elastic, smooth, and no longer sticky (as you knead, if dough is too sticky for you, you can sprinkle just a tiny bit of flour to help it). Step 4 Form dough into a ball and place in a lightly oiled mixing bowl. Cover with damp cloth and place in a warm spot (inside a warmed but turned-off oven is a good place). Leave to rise for 1 hour and 30 minutes. Step 5 Punch dough down. Knead briefly and form into 8 small balls. Arrange on lightly floured surface, cover again and leave to rise another 30 minutes. Step 6 Prepare the za’atar topping. 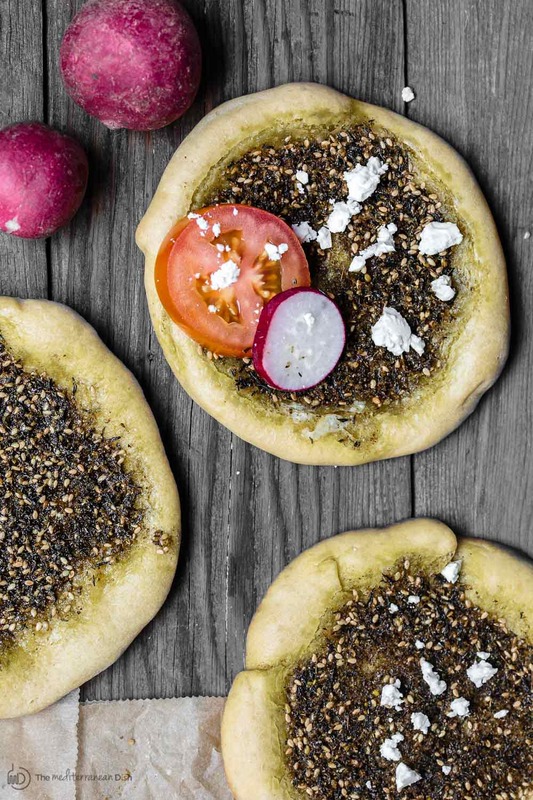 While dough is rising, mix together the za’atar spice and olive oil in a bowl. Step 7 Preheat the oven to 400 degrees F. Place a large baking sheet in oven while heating. Step 8 Form za’atar manaqish. Lightly oil the heated baking sheet and set near you. Flatten the dough into small discs about 5 inches in diameter. With your finger tips, make indentations in discs and add about 1 tbsp za’atar topping in the middle of each disc, leave a narrow boarder around. Arrange discs in prepared oiled baking sheet (use two sheets if needed, do not crowd the manaqish). Step 9 Bake in 400 degrees F heated-oven for 7 to 8 minutes or until the dough is slightly browned on bottom and edges (za’atar topping will remain liquidy at this point). Remove from heat and let sit for 5 minutes or so, the topping will dry and settle into dough. Step 10 Serve za’atar manaqish warm or at room temprature with assorted vegetables, olives, feta cheese, or homemade labneh. Make-ahead instructions You can make these a week or two ahead and simply freeze them in freezer bags (I like to double the freezer bags to prevent freezer burns). Take as many of the manaqish as you need out to thaw at room temperature or in the fridge overnight. Warm in low-temperature oven. If you don’t remember to take them out in advance, you can always simply heat in the oven from frozen. To serve as mezze simply portion the dough into smaller balls, form smaller discs about 3 inches in diameter instead. You should be able to make 12 or more manaqish. When you bake them, watch the oven closely as they will bake quicker.